For the past year, we’ve been using various activity-tracking apps for iPhone to see how they interact with HealthKit, and to assess how well they actually work. Lots of fitness-oriented 3rd-party apps are out there, with great features: Argus runs in the background and turns my iPhone 5 into a pedometer, making it easy to obsess over getting 10,000 steps a day. MapMyWalk includes “yard work” as an activity option, giving me a much better estimate of how many calzones I can eat after a grueling day in the dirt. And Strava lets me compete with other cyclists for the best time on my favorite bike routes. Best of all, these 3rd-party apps can all automatically write data to Apple’s HealthKit ecosystem, giving me a big picture view of all my activity. Naturally, I was excited to see how all of this would play out on the Apple Watch – instead of making sure I’m wearing something with pockets, or otherwise affixing my phone to my body, could I instead leave the phone in a patch of shade, and let the Apple Watch track my activity? Could I look at my watch and see how many steps I’ve taken using the Argus app? I assumed that would be the case. Alas! We’re sorely disappointed. 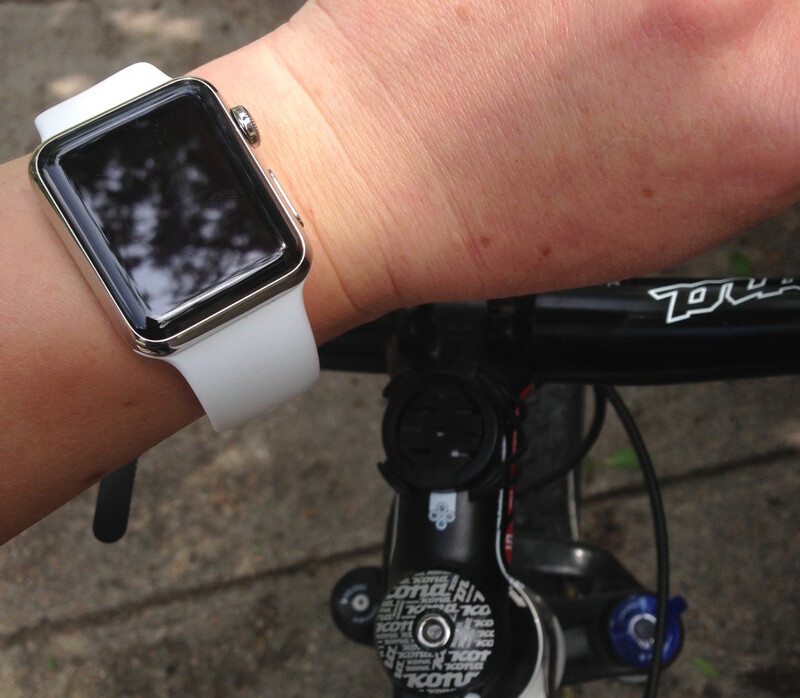 Here, in no particular order, are our gripes with the Apple Watch as a fitness tracker. One issue we noticed almost immediately with the Apple Watch is that it doesn’t seem to get an accurate read on activity. I went for a quick spin around the neighborhood on my mountain bike with Strava running on my phone, while also logging an outdoor bike ride on the Watch’s native “Workout” app. For the sake of comparison, I also brought along my Garmin bike computer, which uses a combination of GPS, a wheel sensor, and a barometric altimeter. Trust but verify, right? Garmin and Strava were in almost perfect agreement, clocking me at a little over 12 mph on average. The Apple Watch, on the other hand, recorded my average speed as 6.2 mph (barely fast enough to stay upright.) This may be due, in part, to the full two minutes I spent trying to end the workout on the Apple Watch. Did I mention the touchscreen is not very responsive? Or what a pain it is (not to mention dangerous) to try to jab at the watchface, while riding a bicycle? Currently, 3rd-party apps like Argus and Strava can’t see the Apple Watch’s accelerometer, heart rate sensors, or other hardware features, like the “digital crown” (that’s the little knob that looks like it should wind the watch, but instead is used for navigation). So for now at least, 3rd-party apps have to rely on the phone for their data, and the Watch is just a mirroring device. Here’s what that looks like in practice: If I put down my phone and walk around, Argus can’t count my steps – only the Watch’s native Activity app does. But in Apple’s ecosystem, the number of steps isn’t visible on the watch itself — only in the Health app on the connected iPhone, and even then they’re not updated in real-time as they are with Argus. The 3rd-party apps would be a lot more useful if their developers had full access to Apple’s Watch API (Application Programming Interface) before the watch started shipping. However, developers are evidently getting access. On June 8th, Apple previewed the second edition of WatchOS , finally granting developers access to the various sensors embedded in the watch. The new OS will roll out sometime this fall, so don’t count on seeing better functionality in time for Century Season and summer hiking trips. But we can hold out hope that someday the Apple Watch might play nicer with 3rd-party apps. For me, the most frustrating thing is that Apple Watch’s native apps automatically overwrite the data from other apps in HealthKit – so when I logged 200 calories burned during a 45-minute bike ride on Strava using my phone, and the Apple Watch calculated the ride as 0 minutes of activity and 53 calories, guess which version got recorded in the Health app? Same goes for that ride where the Watch cut my average speed in half, plus that full day of yard work that resulted in 0 active minutes. We sincerely hope that the Apple Watch will get better as 3rd-party developers finally get their hands on the tools they need to develop compelling apps for it. As it stands currently, the Apple Watch still feels like a beta test and pales in comparison to other, less expensive activity trackers – and what’s worse, it completely throws a wrench into the HealthKit ecosystem by automatically overwriting the data from other apps. Every time I attempt to track a workout on the Apple Watch, I can’t help but feel like Steve Jobs is rolling in his grave. But at least he’s getting activity points for it! For part one of our Apple Watch series, click here.